There are many boy bands, but there is only one that stands out as much as the incredible In Real Life! They’re the immensely talented guys who manage to make everyone’s heart skip a beat. They’re the band who causes pandemonium everywhere and anywhere they go. They’re the amazing group who has stolen the hearts of fans worldwide and who everyone can’t help but swoon over. They’re the stupendous In Real Life – aka the band that everyone is obsessing over. (Could you blame us?!) 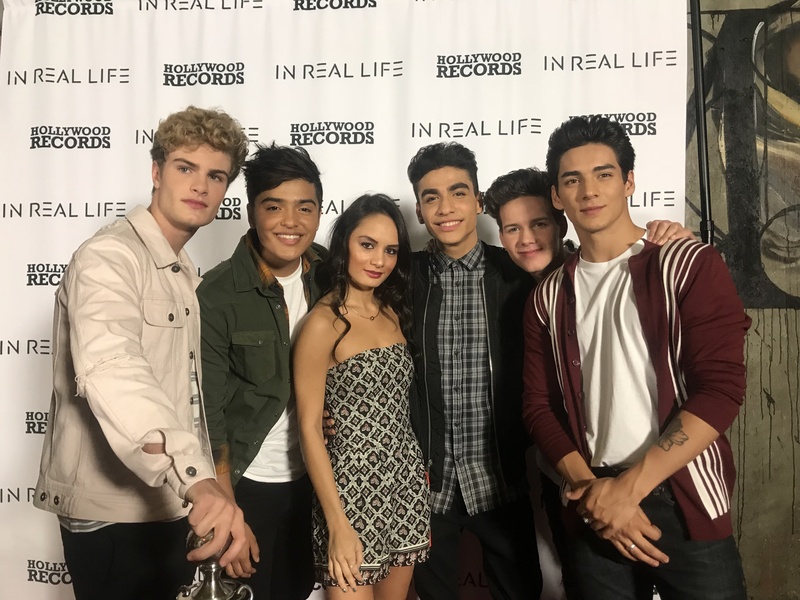 After an exciting journey on the ABC show, Boy Band – five, spectacular guys: Brady Tutton, Chance Perez, Michael Conor, Sergio Calderon and Drew Ramos joined together to create the band we all know and love — In Real Life. However, they not only created one sensational band, they also created a brotherhood, a bond and a friendship amongst each other that can’t be beat. It’s clear to see that Drew, Michael, Sergio, Chance and Brady were destined to join together and conquer the entertainment world as they are doing now. Within just six months of being together as a band, In Real Life has had some of the most awe-inspiring successes and we all know that it is only the beginning to many, many more. In Real Life has already traveled across the country performing at various cities and with each and every performance, they always put their heart and soul into every show and give their fans a day they will never forget. In Real Life’s stage presence is outstanding and they were meant to be on stage bringing out the one of a kind, terrific music we love listening to on constant repeat. Amongst many other accomplishments, In Real Life also just recently performed at Live With Kelly & Ryan as well as the Jimmy Kimmel Show and they were even nominated for “Best Boy Band” at the 2018 iHeartRadio Music Awards. It’s clear to see that In Real Life will continue to make music history and we’re excited to be a part of every step of their wonderful, musical journey. They are truly one band who deserves all of their achievements and the many more coming. I, Alexisjoyvipaccess had an excellent time covering In Real Life’s “Tattoo” single release party and had a great time catching up with the band at the event. In Real Life dished exclusively to Alexisjoyvipaccess all about what the creative process was like making their song “Tattoo,” what it was like for them performing at Live With Kelly & Ryan and on the Jimmy Kimmel Show and so much more only in our VIPAccessEXCLUSIVE updated interview. In Real Life even showed us what their go-to bowling pose is – see it for yourself in our VIPAccessEXCLUSIVE updated interview below. Thanks for another super fun interview, In Real Life! Check out my VIPAccessEXCLUSIVE updated interview with the remarkable In Real Life at their “Tattoo” single release party below! Be sure to buy “Tattoo” out now on iTunes and all music streaming platforms. Previous VIPAccessEXCLUSIVE: Aubrey Miller Interview With Alexisjoyvipaccess At In Real Life’s “Tattoo” Single Release Party! Next Article: Celebrate “I <3 Spongebob" Week With Your Fave Celebs & Nick Stars Starting Monday, Feb. 12th On Nickelodeon!